LOS ANGELES – On April 18th and 19th, the highly anticipated KTOWN Night Market welcomed an estimated 80,000 guests to the Robert F. Kennedy Community Schools for its twoQday community festival. In partnership with the City of Los Angeles District 10, the free to enter event showcased over 100 multi ethnic food vendors, merchandise booths, art exhibits, carnival games, and live entertainment. Both nights featured a food truck lineup curated by Seoul Sausage, which included two winners from Food Network’s “The Great Food Truck Race”—Grill ‘Em All and Lime Truck. 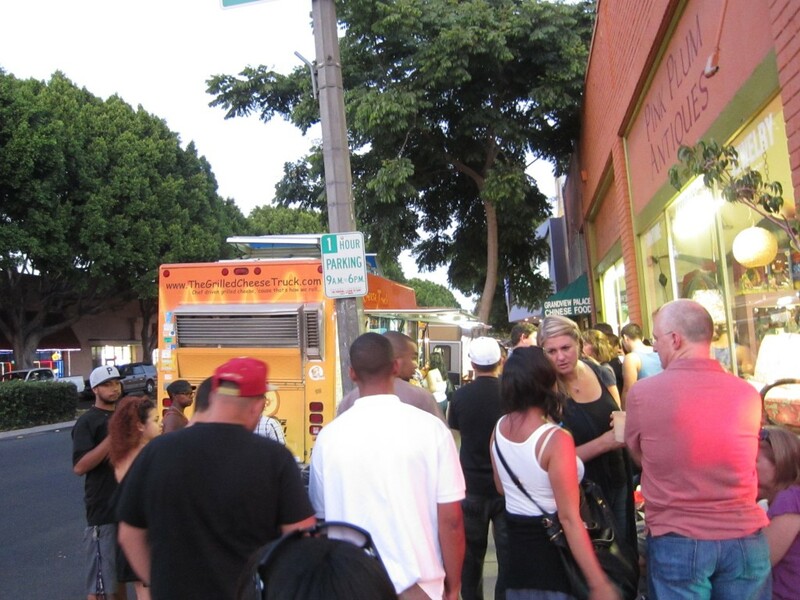 The “Food Truck Alley” also included locally renowned trucks like Fluff Ice, India Jones, White Rabbit, East LA Tacos, Bowled & Beautiful, CoolHaus, Jogasaki Sushi Burrito, and Carb & Nation—the fanQvoted winner of the event’s Last Food Truck Facebook contest. The “Food Truck Alley” was so popular that most of the vendors had to cart in more food after selling out earlier than expected. This by far is the most interesting food truck I ever came across. Not that the food truck looked different, but I guess it was because they served Singaporean food. I never really had Singaporean food so this was interesting to me. The flavors and style of the food was unique enough to the point where I just had to try it. 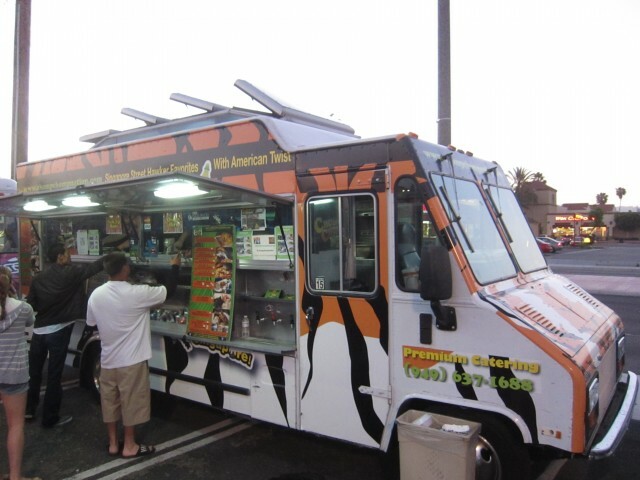 Natively located in Orange County, the truck can be found all around OC for lunch and dinner. I saw softshell crab on the menu and instantly knew that I had to order it. Fried too? Score! 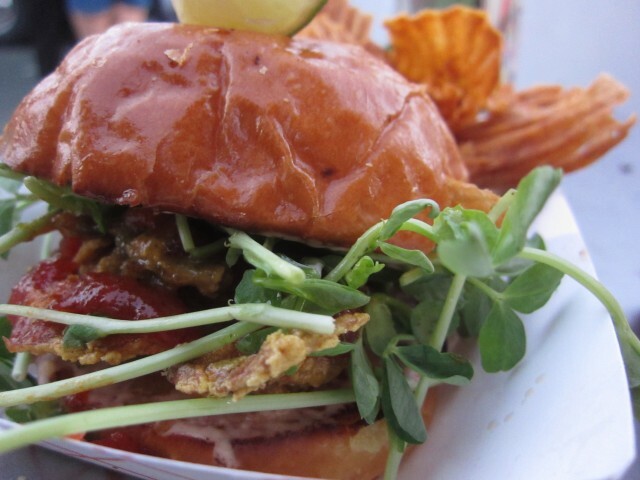 The softshell crab sandwich was seasoned with Singapore Chili and spices. It was topped with a sweet chili crab sauce and Tiger Slaw. Served with a side of Raffles root chips, the sandwich was near perfect. I wish the softshell crab was salted more. 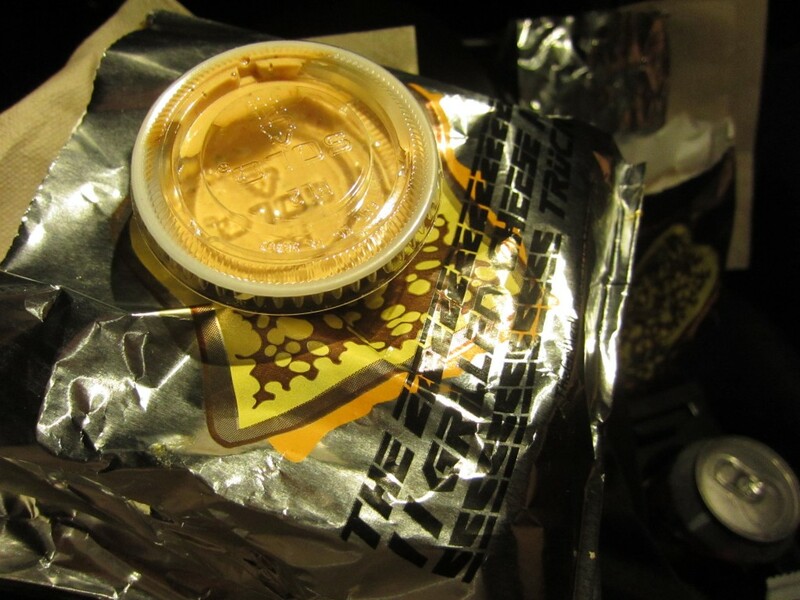 The spices and flavors were there — it just lacked the savory taste. The crab though was cooked nicely and had a good texture. The slaw and sauce took away from the crunch a little, but it wasn’t a huge deal. The crunch from the interesting root chips made up for that. The hot dog in it of itself is an amazing thing. You can add or simplify it to however you want — it is a vessel that can handle anything — a blank slate. I have had some great hot dogs, and I usually prefer the simple kind. A little mustard, onions, and sauerkraut. Think Costco. When I ordered the Hawker Dog at Comp Comp Nation, I wasn’t expecting this. The flavor was so different and so unique — I never had anything like this before. 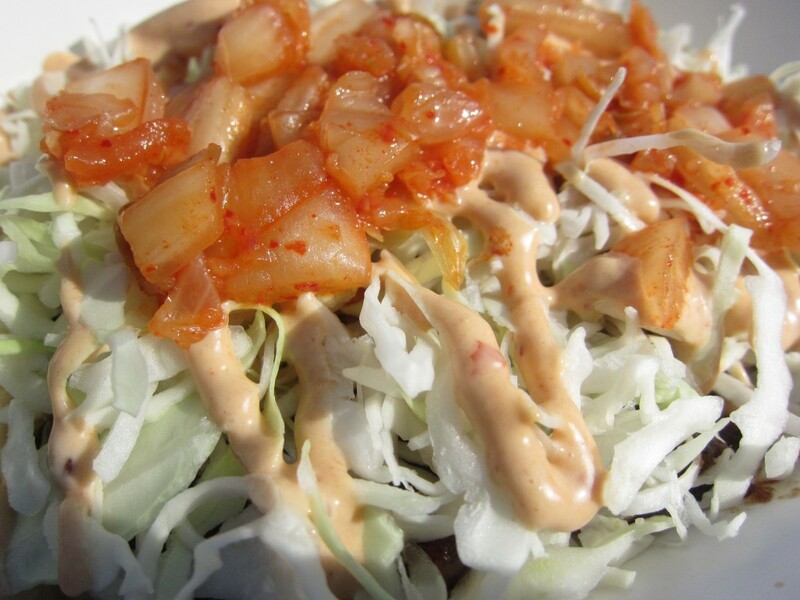 The tiger slaw has 10 fresh ingredients, some of which are cilantro, lime, and chili dressing. 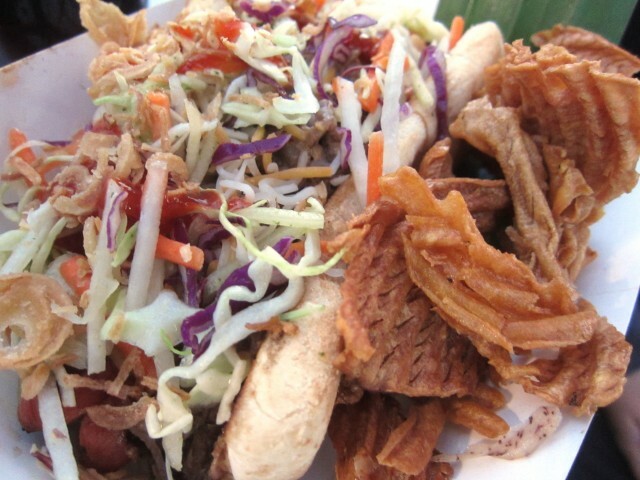 The crispy slaw mixed with the meat mix inside and the hot dog made for a nice balance of taste and texture. This is what a $5 hot dog tastes like. The Singaporean food at Chomp Chomp Nation surprised me. The taste was unique and balanced. Though not traditionally Singaporean, meaning not heavy on the rice and meat style dishes, the “burger” and “hot dog” approach was nice. It made for a nice vessel to try the food. If you ever find or come across this truck, take a chance. Being winners of Food Network’s “The Great Food Truck Race,” there was a lot of expectation. With the new season of the food truck competition underway, it was good to try the last year’s winners. Seeing the truck on TV, it seemed to be almost a celebrity. The lime green was hard to mistake, and even more difficult to miss. The trio of chefs always pumped out amazing dishes and came out on top. I have been yearning to try their food and I finally had a chance. Though I weren’t able to meet the semi-famous chefs, getting a taste of their food was good enough for me. 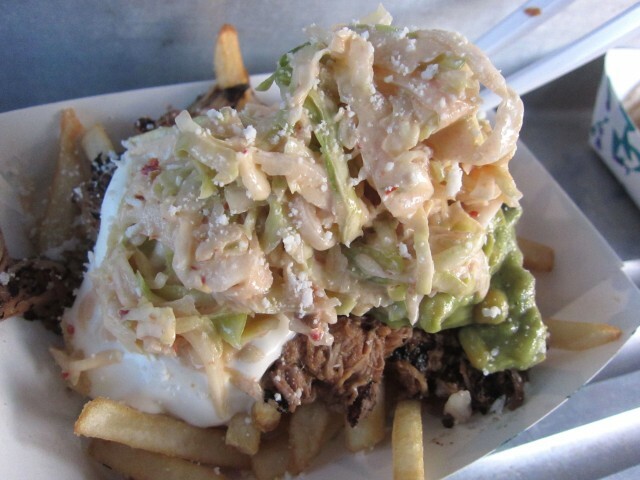 Their carnitas fries are probably their most famous item on the menu. The pork on top, roasted for 12 hours was soft, but a little try. The help of the crema, guacamole, and chipotle honey slaw helped out a lot. The crunch of the slaw and the tender meet was a great match. The fries were a perfect to soak up all those flavors. The topping of cotija cheese gave it a nice salty flavor which it needed. In my opinion, the cotija was necessary and completed this dish nicely. I just wish I had more of this. The Short rib sliders were amazing. The beer braised short rib was tender and flavorful as it should be. Topped with spicy ramulade and arugula, the sliders were impressive. Even the bread was soft and helped make these small sandwiches better. This was completely worth it and went perfectly well with the carnitas fries. There comes a time when you get greedy and order something you regret. 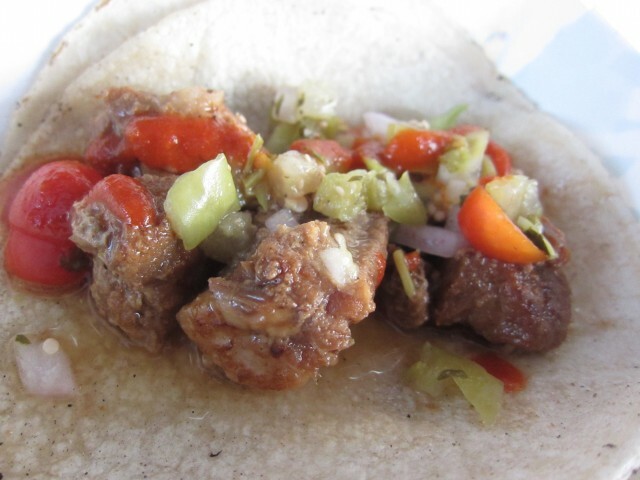 The adobo tacos were just that — money well spent. The adobo style pork belly was nearly dry — I was thinking pork belly, fatty, tender, and fatty. The pork in these tacos were lacking in quality and quantity. The green tomatillo, pico de gallo, and sriracha on top was tasty, atleast. The taco as a whole didn’t work for me. The tortilla was kind of cold, the protein a little off — it just didn’t do it for me, especially for 3 bucks. If you are a food truck, doing tacos right is a must. I mean, food trucks were born from this stuff. The Lime Truck, the famous green gourmet food truck blew up. The semi celebrity status meant more eyes on them, more judging eyes at that. Honestly, if it weren’t for Food Network’s “The Great Food Truck Race,” would I even consider their food? Maybe, maybe not. 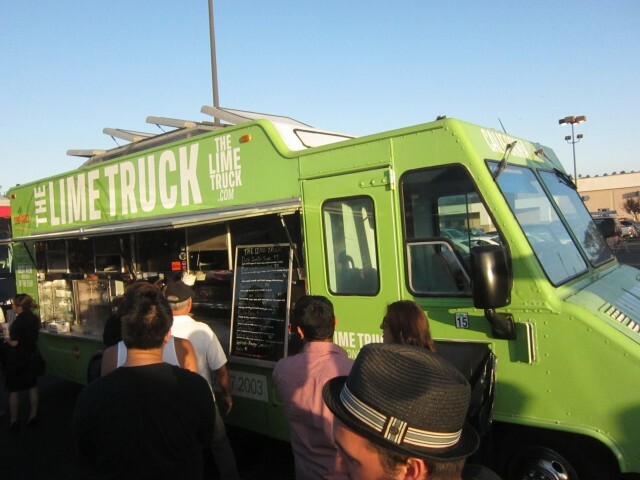 The reality is, The Lime Truck pumps out pretty awesome food. The incident of the adobo taco might have been on the off chance they were having a bad day. Either way, 2 out of the 3 items I ordered were a home run, and I guess that is what matters. 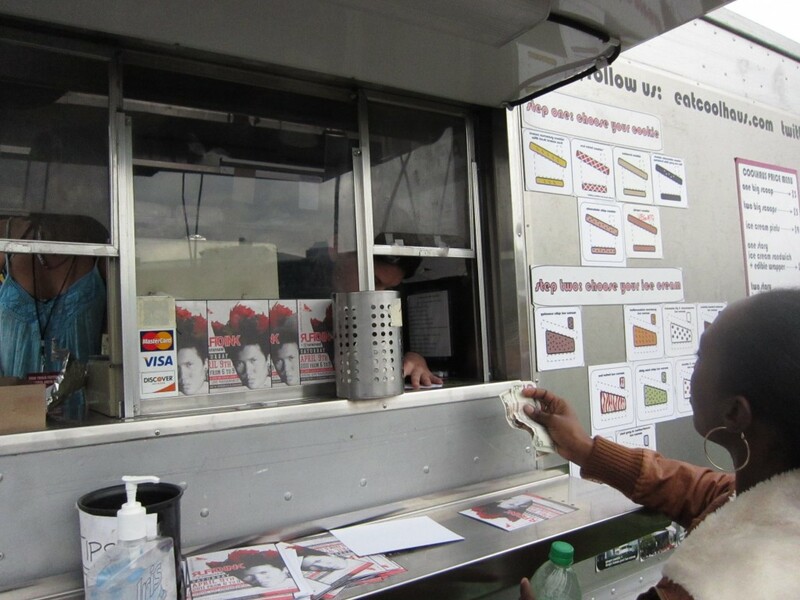 Look at me, showing favoritism to the celebrity food truck — I must be selling out. The reality is, the good items were really good, the bad items were just plain crappy. I guess you just have to order the right things. 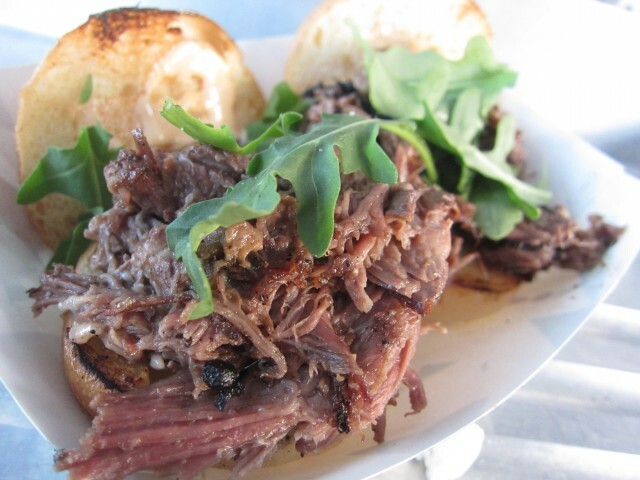 Plain and simple — carnitas fries / short rib sliders. We all have our favorite go to BBQ joints. Some of my favorites, interestingly located in Orange County is Blake’s and the chain, Lucille’s. LA and Orange county is in a position where good barbecue joints are plenty, but truly great ones are few and far between. As of yet, I don’t have a favorite authentic bbq spot. 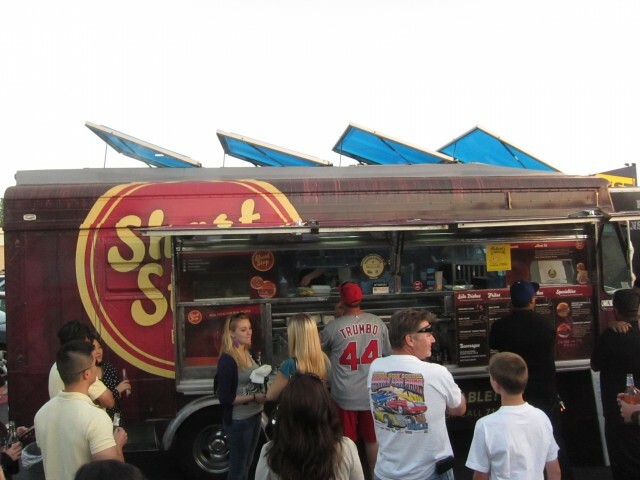 Short Stop BBQ, a mobile food truck serving, well, BBQ was a shot in the dark. I didn’t know anything about it and I didn’t do my research beforehand. I just saw the words BBQ and I went for it. It let me to wonder how a food truck can smoke racks and racks of ribs and slabs of pork. Intrigued, I had to try their bbq. I ordered the pulled pork sandwich, a common item at any bbq joint. Topped with creamed corn, I was excited to try it. The pork was tender, but as expected, it was a bit dry. The creamed corn, though it helped moisten the pork, it was mushy. Traditionally, pulled pork sandwiches have a slaw of some sort. This gives it a nice bite and crunch with the tender pork. The creamed corn actually added to the pork’s mush. I wanted the corn to have that bite that the cole slaw offered. The bbq sauce, another important element in good bbq was a bit lacking as well. It didn’t have a flavor profile that distinguished itself from the rest. It was neither spicy, sweet, or tangy. Maybe the creamed corn had to do with the taste of the sauce, but it would have been better with a more pronounced sauce. Don’t get me wrong. The sandwich wasn’t all bad. The bread was a perfect, and the pork in it of itself was great, but the sandwich didn’t leave me wanting more. I ate it, and it was immediately forgotten — I didn’t crave it after it was all gone. I know. It was only one thing out of all of their items on the menu. Still though, a sandwich that is probably the most important when it comes to bbq should be the end all, be all. I would like to give Short Stop BBQ another whirl. Their tri tip sandwich seemed promising with the “bleu slaw” and the burgers with smoked pork belly seems like a winner. Heck, even their bleu cheese and tri tip frites seem delicious. Did I order the wrong thing? Possible. I just know that great authentic bbq is hard to find at any restaurant. 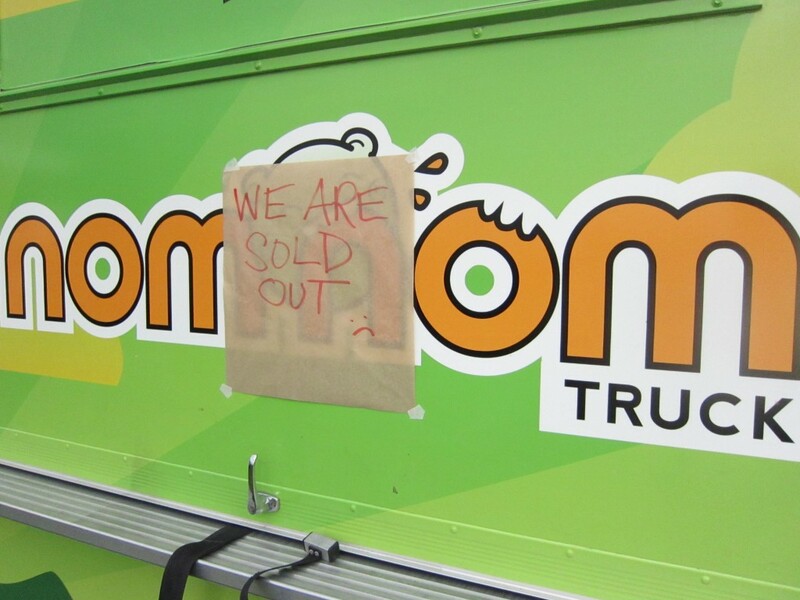 That means finding it at a food truck is a near impossible task. But then again, it seems to me that I have a weird and insatiable criteria for bbq. I would have a field day if I ever had a chance to try the great bbq meccas in America, whether it be in Texas, Illinois, Kansas, or the Carolinas. Some day, I suppose. Sadly, those may never reach the west. Food trucks are an amazing thing. 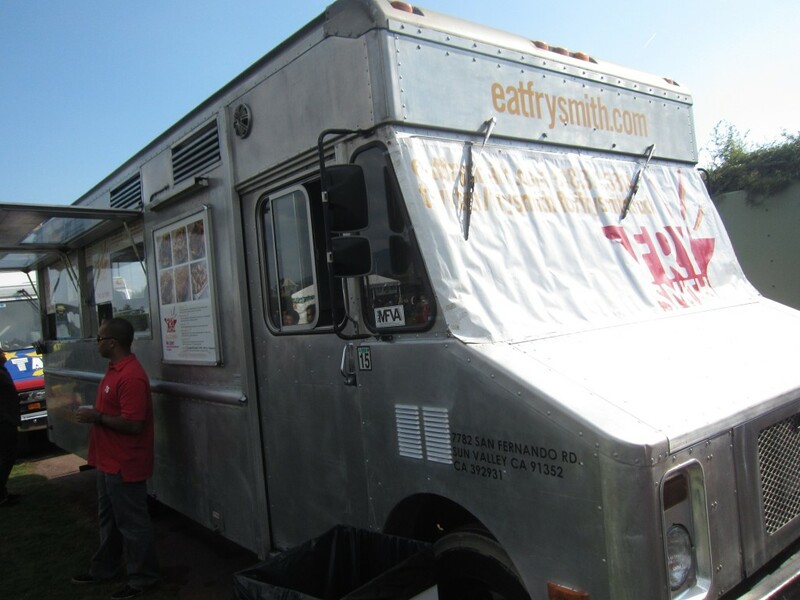 You can get practically any kind of food you desire off of a food truck. 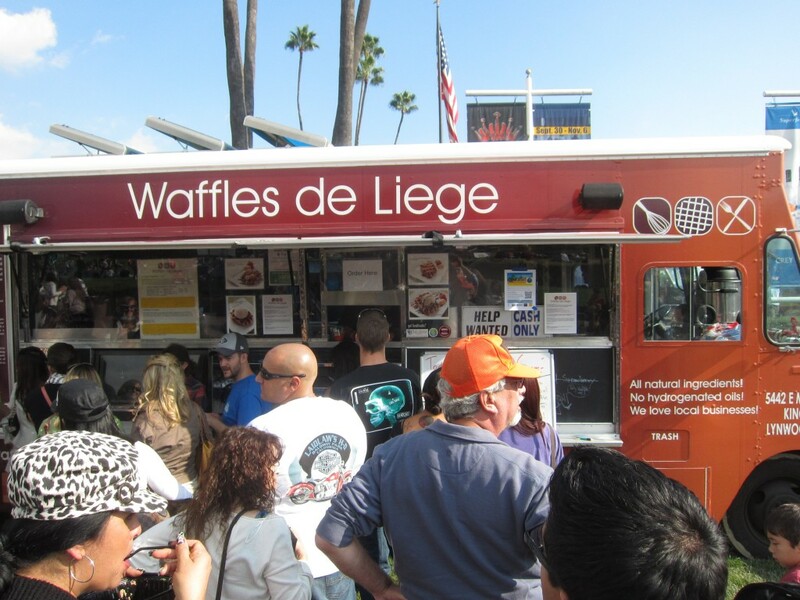 Waffles De Liege, for example serves up some awesome waffles. Their waffles are not the breakfast kind, though anyone would be happy to have these for breakfast. According to their website, there are two kinds of Belgium waffles. Brussels waffles, the ones we see everywhere, is the more common kind of waffle. Liege waffles are more rich and sweet. Obviously, the waffles they cook up are Liege waffles. Hence the name, Waffles de Liege. Their dessert waffles are simply amazing and topped with Fosselman’s ice cream — A match made in heaven. The line for this truck was long. Not too long where we were deterred from waiting, but there was a nice crowd in front of the truck. Looking for something sweet, I knew this was a perfect choice. When I found out they served Fosselman’s ice cream with their waffles, I knew it could not lose. I was honored to find that my hometown ice cream was being served on this truck. I had to have it. I ordered the toffee ice cream on a waffle with chocolate and caramel sauce. As much as the Fosselman’s ice cream was superb, the waffle was amazing. The outside was crisp and had a perfect crust to it. The inside was nice and cakey and wonderfully soft. The texture contrast of the soft inside and the crispy outside, and of course the creamy ice cream was perfect. I wouldn’t mind eating this every morning by itself. It really held its own as a waffle. The dough was indeed the star of this dessert. It was sweet, but not too sweet. It was perfectly delicious. When you have something so good, you hold on to it. 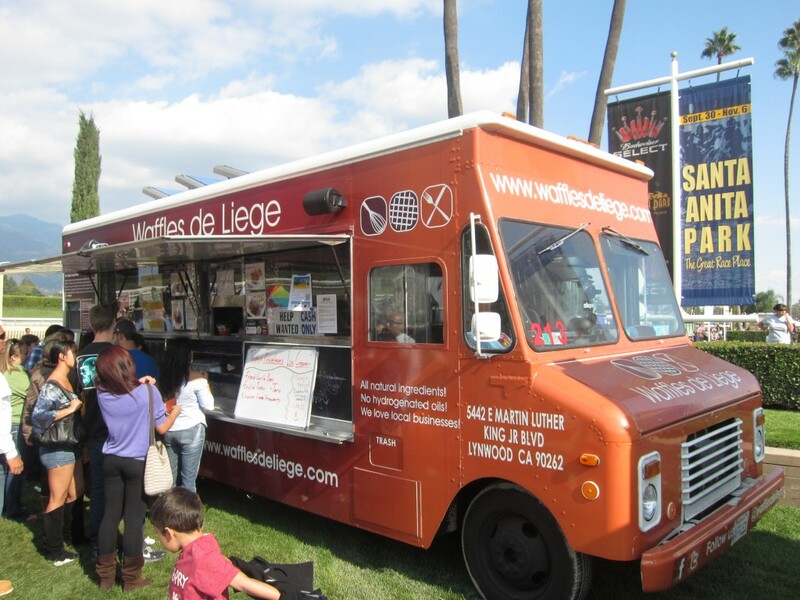 The Waffles de Liege Truck has something amazing on their hands. 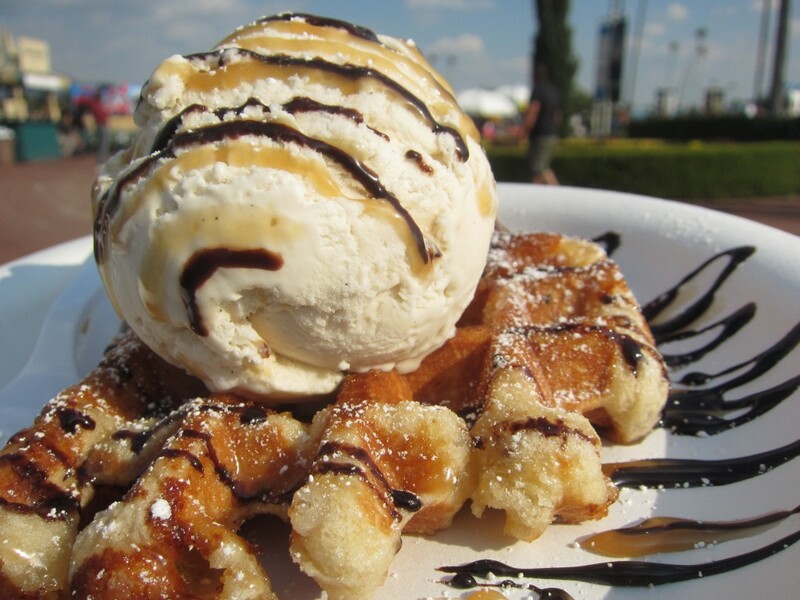 Waffles and ice cream, that is the golden ticket. Sauce it up with caramel and chocolate, or make it “healthy” with some bananas and strawberries — it is all good. But really though, that Liege waffle is all I need. The White Rabbit Truck was a pleasant surprise. I heard about them a lot online and in the media, so I was excited to try their food. This truck, a Filipino fusion truck, serves their take on tacos and burritos as well as rice bowls. A fan or Asian fusion with Mexican, I was inclined to try their most famous item on the menu, the pork sisig burrito. The pork sisig burrito had garlic rice, pork sisigs, egg, and cheese. This was a perfect balance of flavors and textures. The pork was nice and tender. Their pork sisig is deep fried pork belly, fried in onions and jalapenos. The almost runny egg and cheese was a perfect creamy and velvety texture. Their garlic rice was perfect as well. My gripe about some burritos is that the tortilla is not soft. 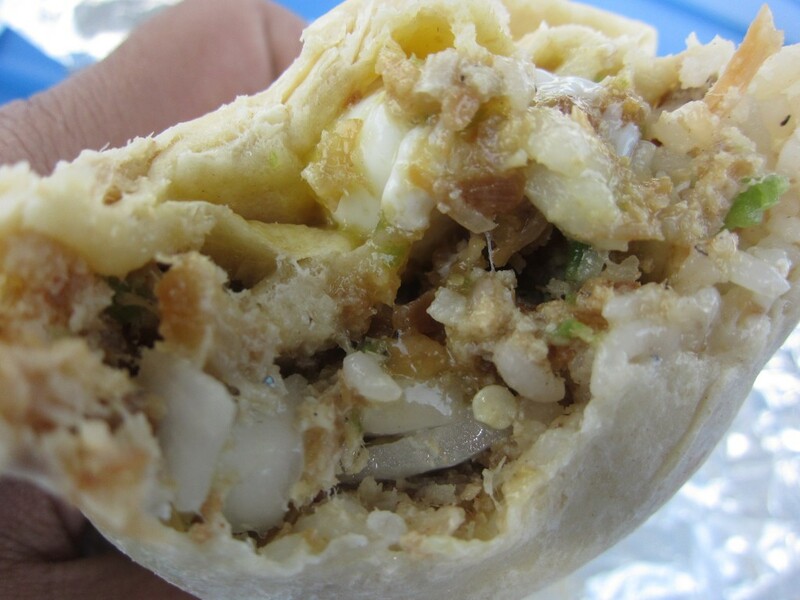 I liked the tortilla from the sisig burrito — it was soft and chewy, almost silky. This burrito was perfect because each individual item inside the burrito was perfect — together, it was exponentially more delicious. 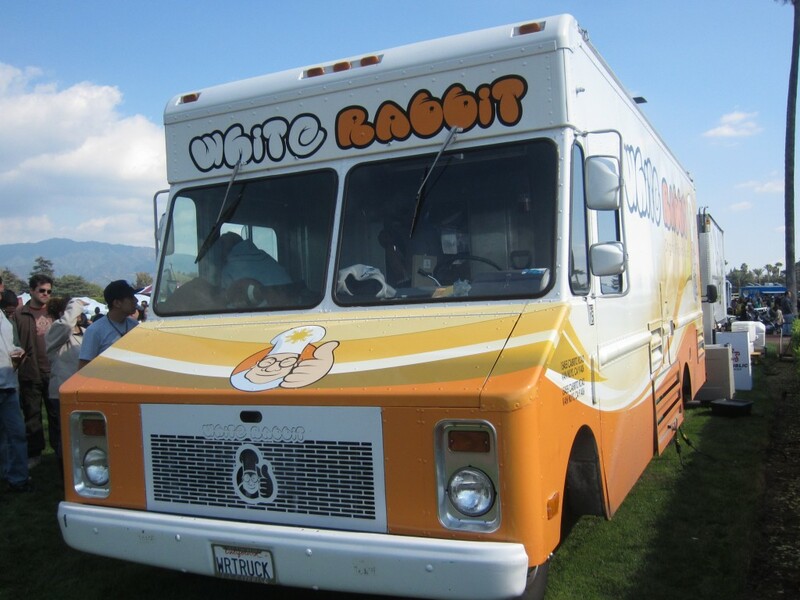 The White Rabbit Truck offers a food eating challenge, which they are known for. The burrito is almost 2ft long, and contains, 6 eggs, 3lbs of any choice of meat, 6 scoops of rice, 12 cheese slices, wrapped in 6 tortillas. That equates to 6 pounds! — Definitely bigger than my single tortilla burrito. Here is the video of Adam Richman from Man v. Food on the White Rabbit Truck. Watch to see them make this monster, and see someone eating it. Does he actually finish it? Honestly, I was happy to eat the burrito (the regular one of course). Each bite gave me a smile. Though I only had the normal one, one day, I shall attempt and possibly finish the challenge. Am I crazy? Maybe a little. Until then, the regular one will do for me. Just like the chef on the logo, White Rabbit Truck is a thumbs up! I’m not much of a punk rocker, hard rock kind of guy. Metallica, Kiss, and all the rest, I never got into it. But that in itself attracted me to this burger food truck. Grill Em’ All makes some crazy burgers, and I just had to see what they were all about. I ordered the Molly Hatchet. It had seared fennel sausage gravy, bacon, maple syrup, and a thick patty, all between two buns. I can safely say, I ordered the wrong thing. Though this is one of their famous items, the flavors weren’t working for me. 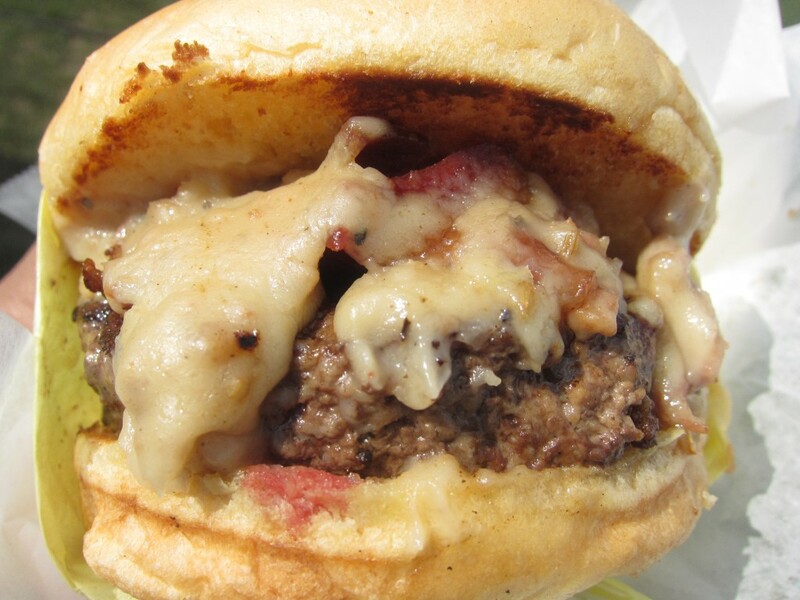 The sausage gravy, which sold this burger, to me was more of a disappointment. The maple syrup somehow coagulated with the gravy, and made a rue of sweet buttery goop. The patty and bacon was my favorite. It was juicer than ever and thick as ever. The lack of cheesy goodness and other ingredients made this a mistake, on my part. Next time, I should and will order better. Something more along the lines of the the behemoth, and h-100s. The behemoth has grilled cheese buns. Yes, the top bun is a grilled cheese sandwich, and the bottom bun is a grilled cheese sandwich. Between these two sandwiches is cheddar, bacon, beer soaked onions, pickles, and bbq sauce. 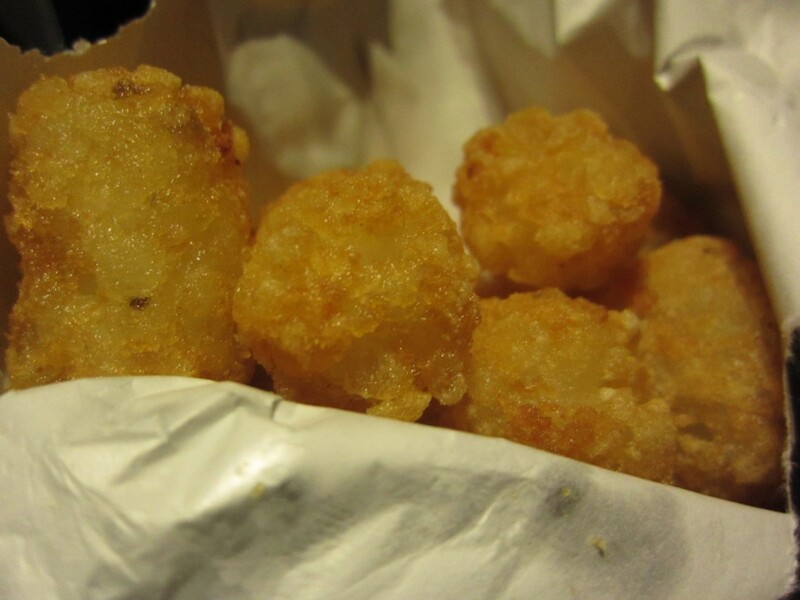 The H-100s are cheddar cheese and jack cheese filled hand rolled tator tots. Yeah, and I chose the weird and quirky maple gravy burger instead. Again, I messed up. These guys know what they are doing. The grill was always full and the lines were long. I wish I had their other items. That is where you come in I guess. Learn from my mistake and get the above mentioned monsters. Let me know how it goes. 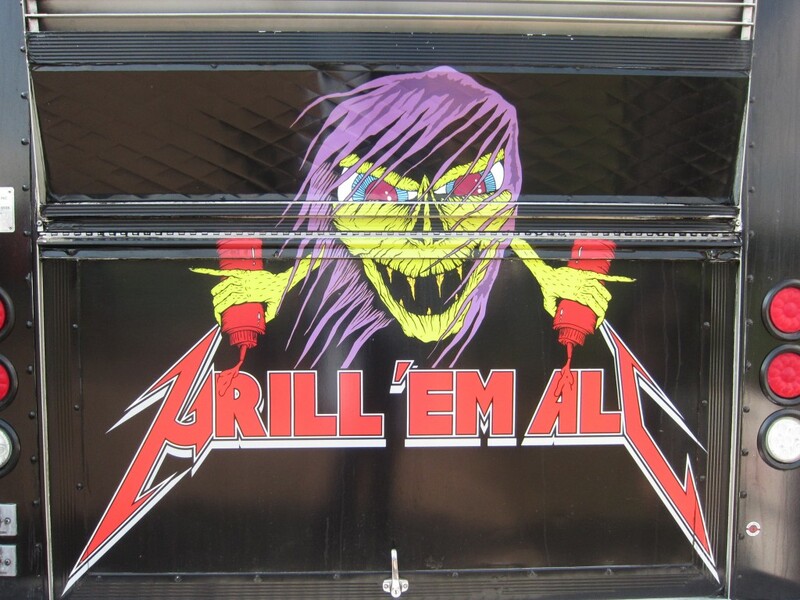 Until then, Grill Em’ All will surely grill do that — grill them all. 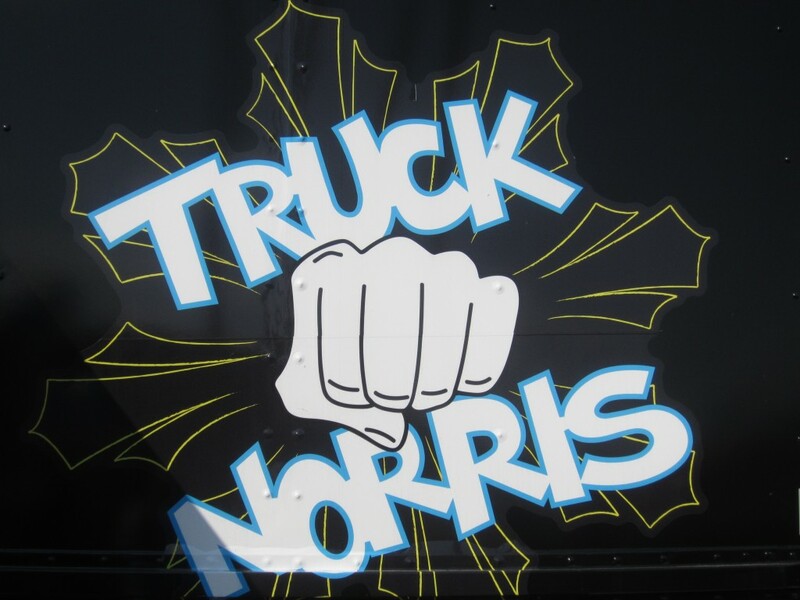 Truck Norris, an obvious play on words from Chuck Norris — It is an awesome name for a food truck. I don’t know what Chuck Norris has to do with food trucks, Filipino Asian fusion even, but I guess it is catchy and epic. Makes you think that Truck Norris can count to infinity twice, or that the food can cure cancer. At any rate, the name gives great anticipation for what the food will be like. In all honesty, the food doesn’t even come close the the epic-ness of Chuck Norris. I ordered the bbq short rib bowl. It had bbq short rib, rice, shredded cabbage, and kimchi. For 9 bucks, I was expecting an actual meal, or at least some kind of sustenance. The bowl had a thin layer of rice, bbq beef bits, cabbage, and kimchi. Right when I got it, I knew it wasn’t worth it. Though the short rib was tasty, there just wasn’t enough rice to enjoy it with. If it were a mound of hot rice to enjoy it with, I’d be happy. Something about the dish wasn’t fulfilling. I still don’t get the name. Does Chuck Norris like Filipino Asian fusion? I don’t see the relation. I guess it’s just a cool name for a food truck. But really, what good is a name when the food disappoints? 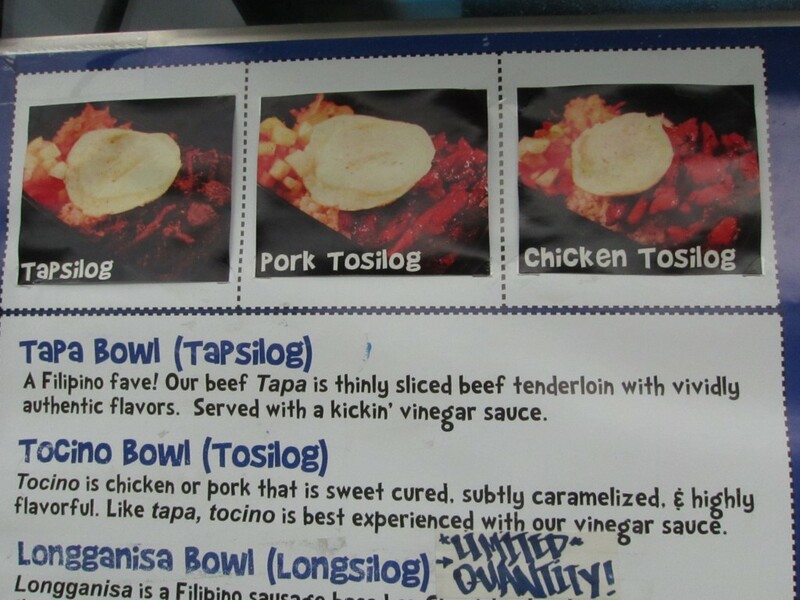 I enjoyed Tapa Boy because the prices were reasonable and the food was good. Yeah, I only tried one of the items on the menu, but according to them, it is one of their popular ones. If they can’t get that right, not even Chuck Norris can help them. When choosing what food trucks to try, I go by a lot of things. I see what I am in the mood for, if I heard some buzz about them, and the affordability and taste factor of their menu. 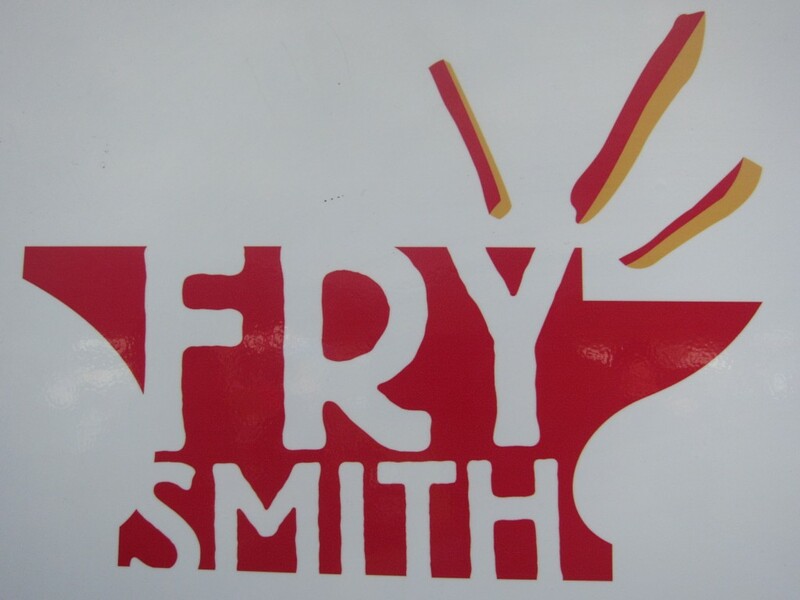 Frysmith Truck serves fries that you can eat as a meal. They are all about quality and being humane. All of their meat are from free range, and they only use kurobuta pork. All of their utensils and drink containers are all biodegradable. They even reuse the fry oil to run the truck. Amazing. They go the extra mile to be better to the Earth and the animals. That kind of care shows in their food. 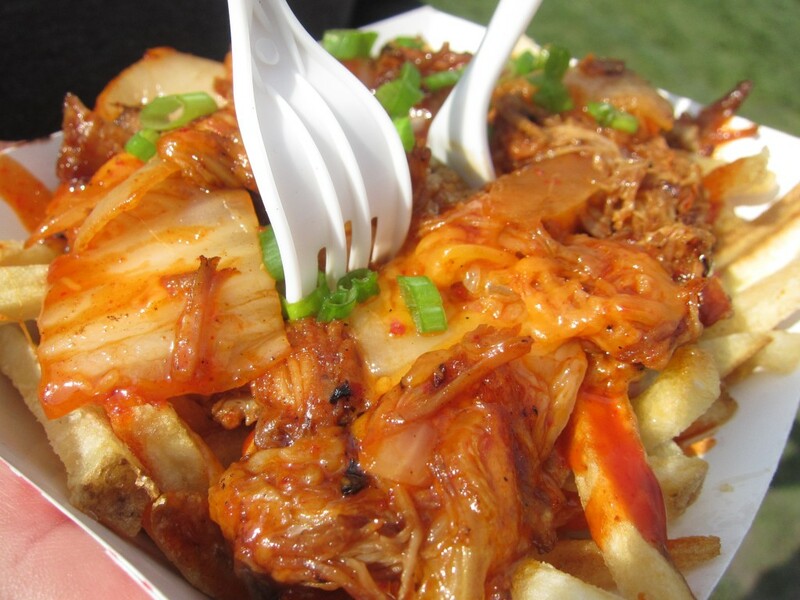 It seems like everyone is heading towards the Korean craze, especially with food trucks. At the Frysmith Truck, I could have had the regular chili cheese fries, or poutine, but I wanted something different. Fries and gravy? Been there, done that. 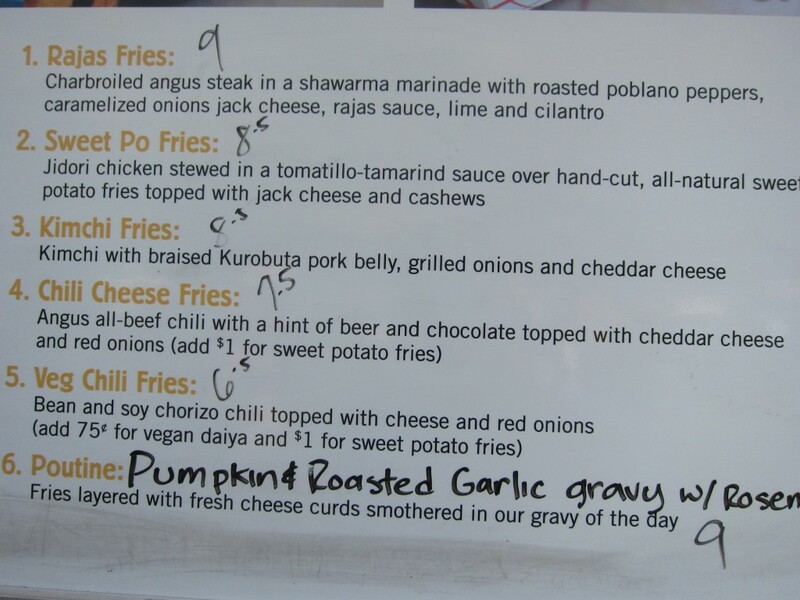 I had a choice between the kimchi fries or the rojas fries. Being Korean and all, and wanting to see what this is all about, I opted for the kimchi fries. The fries were freshly cut — it reminded me of the fries at In-n-Out. On top, they melted cheddar cheese and put a generous amount of kimchi. Though they could have added a little more pork on top, the quality was superb. The kimchi had a sweet, not too spicy aspect which was perfect with the crispy fries. The green onions brought everything together. This hit home, yet it was so different for me. From the looks of the empty plate, it was delicious. It was a great experience to try this food truck. Fries loaded with some of my favorite foods. What isn’t there to love? I wish I had room in my stomach to try the rojas fries which consisted of chilis, steak, and cheese. Definitely something for the future. Though the menu is small, they know what the people want. Fries with a bunch of tasty stuff on top. It doesn’t get any better. Who doesn’t like a grilled cheese sandwich? It is a childhood standard meal. I always think of those Kraft cheese commercials where they split open a grilled cheese sandwich, and all that gooey cheese starts stretching out. Man, I love that commercial. The cheese has to be the star of a grilled cheese. Though they do have regular grilled cheese sandwiches, the ones I ordered weren’t ordinary at all. 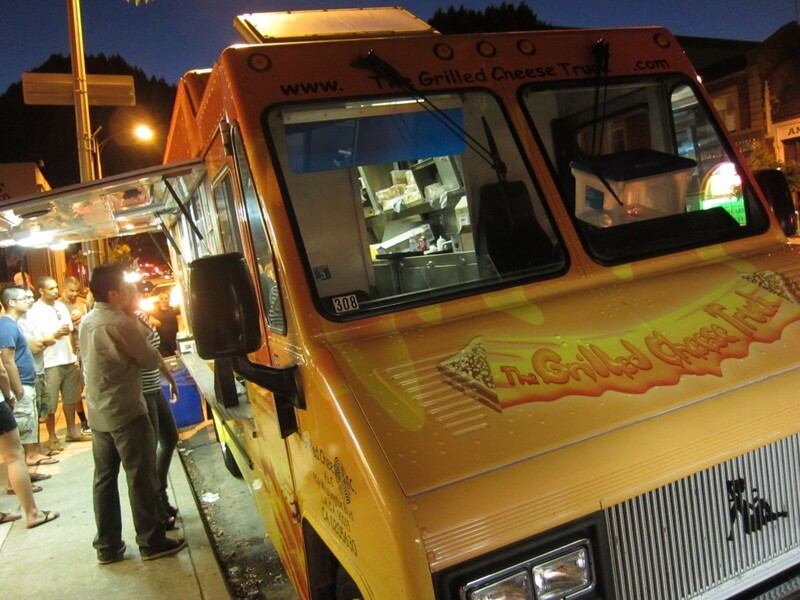 The Grilled Cheese Truck uses cheese, and they use the good stuff from Tillamook. I don’t really know if they are a partner or they just use exclusively that brand, but the cheese is top notch. You can check out some of their recipes there too. What’s better than grilled cheese that mac and cheese? 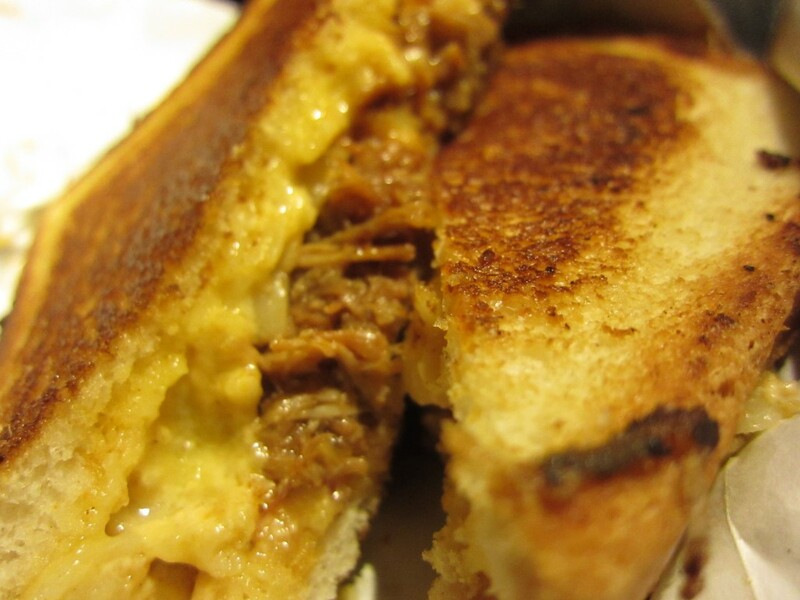 The cheesy mac and rib, undoubtedly one of their most famous sandwiches, had macaroni and cheese made with sharp cheddar, bbq pork, and caramelized onions. Surprisingly, the bbq pork was the star. It wasn’t dry or bland. The the consistency was mush on mush, the mac and cheese was cheesy and delicious. It was a solid sandwich. The brie melt was probably my favorite. It had bacon and fig paste on a peppercorn potato bread. Aside from the bacon, the best part was the almonds inside. It gave it that texture I was craving. 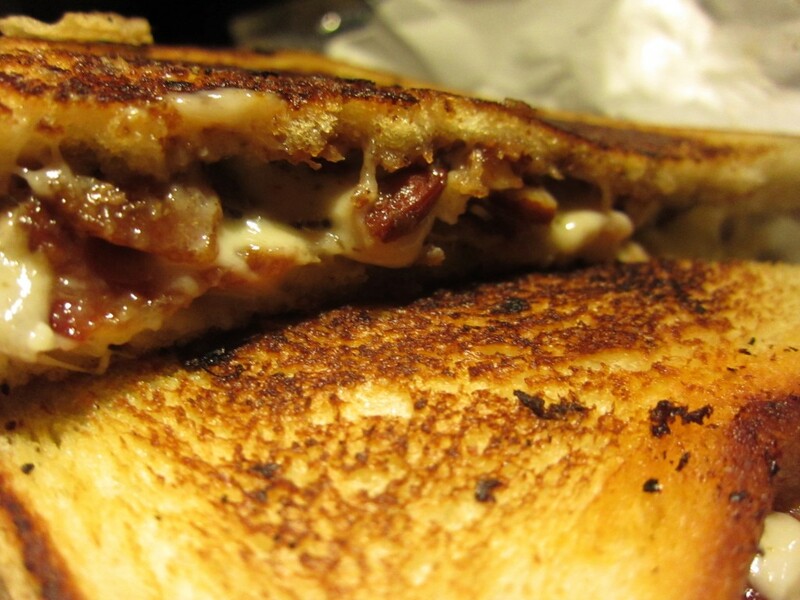 The creamy taste of the brie went well with the bacon, and the fig paste gave it that sweetness. It was a perfect sweet and savory combination. This one wasn’t your typical grilled cheese, that’s why I liked it. 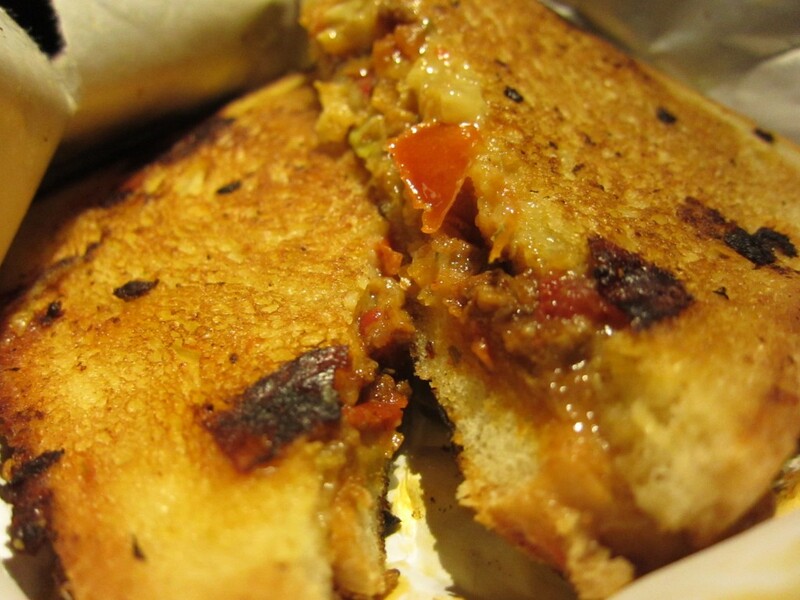 One of their popular sandwiches is the pepperbelly melt on habanero bread. It has chili inside with a mix of salsa. The kicker was the crushed Fritos corn chips inside. Though the chips were soggy and got lost inside the sandwich, the taste was bold and spicy. Intense and delicious. All these delicious sandwiches were accompanied by some tater tots. Surprisingly, the tater tots were nice and crispy. They were especially delicious dipping them in the cheese sauce. Sandwiches and tater tots are an amazing combination. It took me back to elementary school days in the cafeteria. This is an awesome food truck. The lines get really long. If you notice the pictures, the sun is out while I was waiting in line, and the sun had set when I got my sandwich. 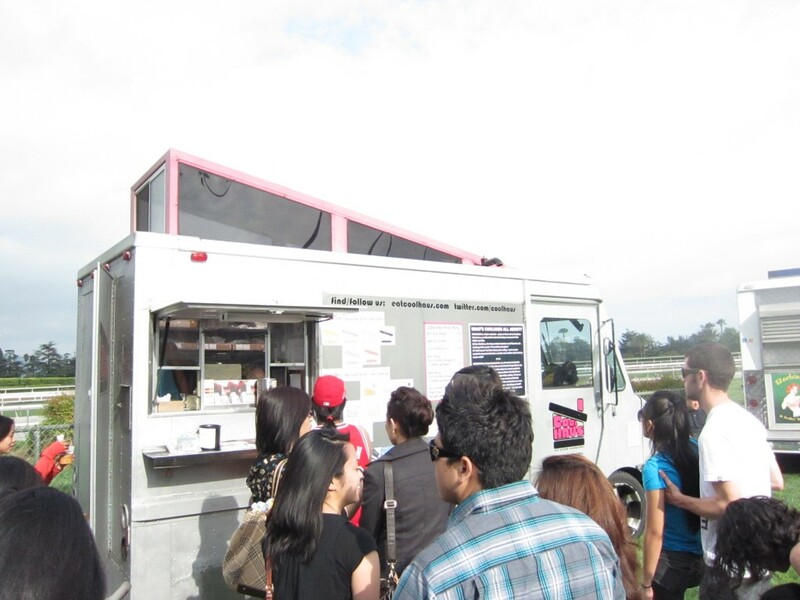 I remember back at the Santa Anita Food Truck Fest, the lines were the longest I have ever seen, and they were sold out. I don’t know how that happened, but it did. This time, I was smart. I follow them on twitter, and lucky for me, they were in my neck of the woods one evening. The line was still long, but manageable. They are one of the top gourmet food trucks in Los Angeles, and I finally got mine. I remember me and friends were talking about the next big food truck. I cleverly thought of a food truck that serves ice cream — going back to the basics with a twist. After a bit of silence, my friends burst out in laughter, teasing me that there were ice cream trucks everywhere! Far beyond my time, a slew of gourmet ice cream trucks came following after. My favorite? 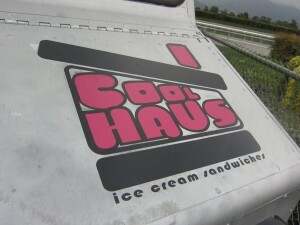 Coolhaus. I had some ice cream sandwiches where the cookie was too soft, or the ice cream tasted like ordinary. Coolhaus on the other hand does theirs perfectly. I had a chance to try the balsamic fig and mascarpone on a double chocolate cookie, and the ricotta and sour cherry on a lemon rosemary cookie. These flavors were really nice. The balsamic fig and mascarpone is my favorite. A little sweet from the figs and balsamic, and the mascarpone cheese just rounds out the flavors nicely. The sour cherry and ricotta had a subtle cherry flavor with a creamy texture — it tasted like a cherry cream soda, but creamier. The lemon rosemary cookie was a bit off putting though. The double chocolate was sweet and familiar, whereas the rosemary was a bit too savory for me. Even though I didn’t like the taste, I crave that cookie once in a while. The cookies held the ice cream well without falling apart. I was sad that they ran out of the red velvet cookie, but my double chocolate chip cookie was good second choice. It looked good with the cross cross frosting over it. The best part is the edible wrapper. Made from potato starch, the wrapper holding the sandwiches are completely edible. Though it tasted like nothing, it was cool to be able to eat it. No waste, no fuss. Little things like this make Coolhaus special. 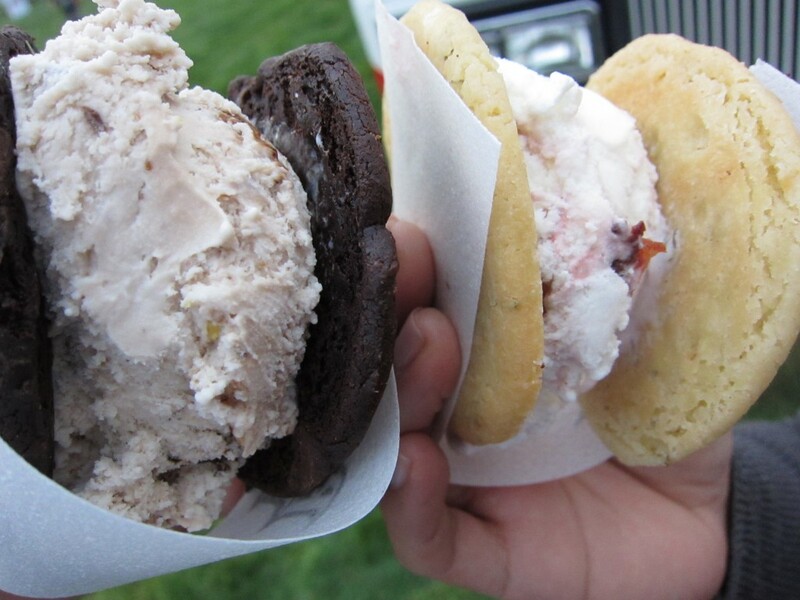 These really are the best ice cream sandwiches. The ice cream flavors in itself are amazing, let alone, the cookies. They should really consider selling these world wide at markets and specialty stores. No, maybe not. These wouldn’t be special now would they — It wouldn’t even be from an ice cream truck like I imagined in the beginning. For now, we have to follow them on Twitter @COOLHAUS I guess. Filipino food is very special to me, and I love it. Anything with meat and rice, I love. 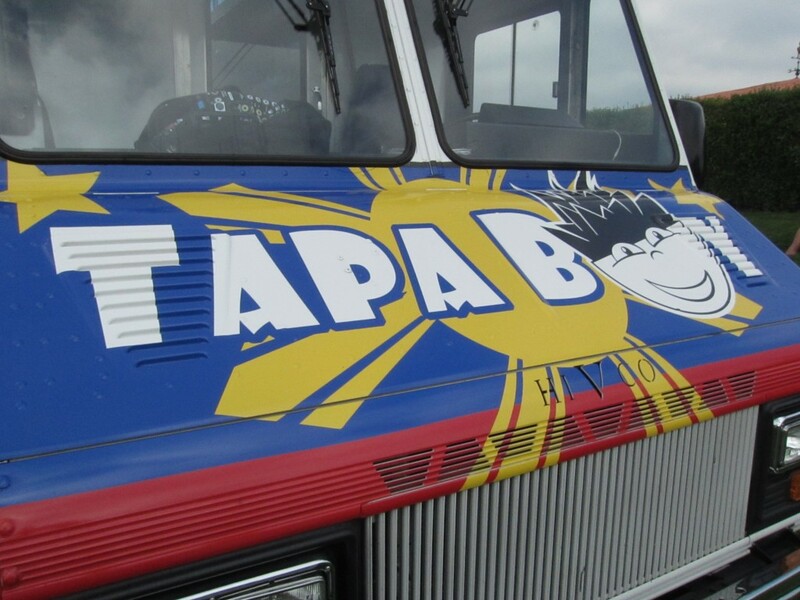 When I had the chance to try Tapa Boy, Filipino cuisine food truck, I jumped on it. In all honesty, anything with meat and rice, I can eat it for days. That would be a big weakness of mine. 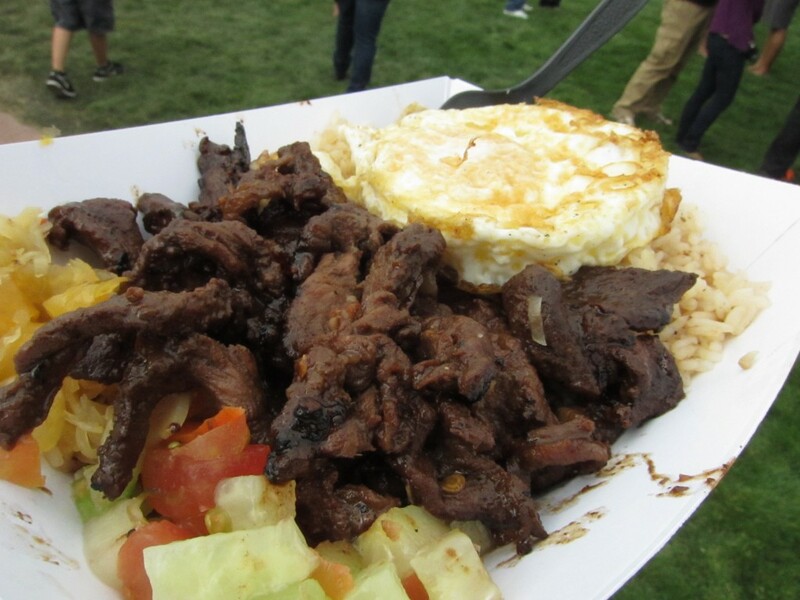 To me, meat and rice is lunch or dinner, but for the guys at Tapa Boy, it’s breakfast. I tried the Tapa Bowl, Sinangag Itlog Beef. It comes with a bed of garlic rice, beef tender loin in a teriyaki type sauce, pickled veggies and an egg on top. This thing really felt like home cooking to me. As a kid, I would come home, and all there would be is rice in the cooker, and a pot full of beef or pork. I’d just mix the two with some soy sauce and I was set. This dish really reminded me of that. And the runny egg on top, well, you guys should already know how I feel about that. I love it! It was delicious. The pickled veggies really rounded out the flavors well. Upon picking up my order, I was handed one of their fried dessert plates. 50% of me knew it was a mistake, 50% of me said, “oh free dessert?” After correcting the clerk’s mistake, I had regretted not ordering one. The desserts are fried egg roll wrappers, wrapped in some kind of banana custard or flan. It looked delicious, and I would probably try that next time I see these guys. 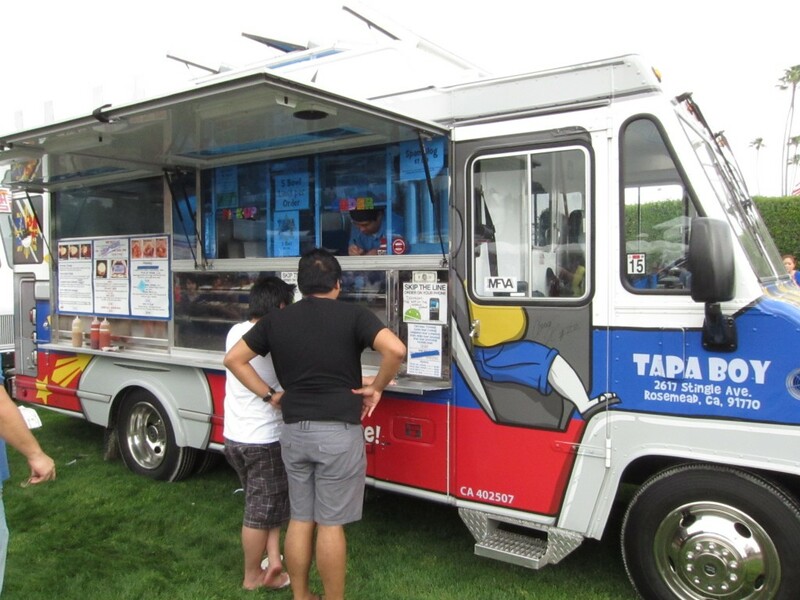 Tapa Boy found their niche in the food truck game. They do home cooking of meat and rice and it truly hits home. The first time I had a banh mi sandwich, I was interested to know where these sandwiches were all my life. For those who do not know what these wonderful sandwiches are, let me attempt to explain. Banh mi is a traditional Vietnamese sandwich. Proteins include chicken, pork, ham, or other variations of deli meat. Veggies include cilantro, cucumbers, spicy jalapenos, pickled daikon radish and carrots — all this on a crip and crusty baguette, spread with mayonaise. Simply delicious is what that is. 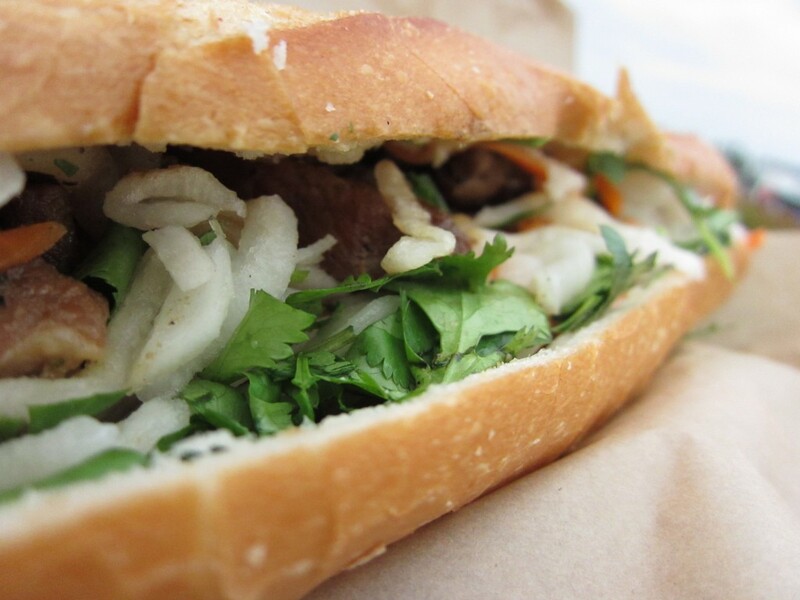 The Nom Nom Truck serves some authentic banh mi sandwiches. I feel like it was yesterday when I saw this truck on the Great Food Truck Race on the Food Network. I was surprised to see a banh mi sandwich truck do so well. Despite my lack of judgment, they gained a lot of fans and devout followers. I was proud to see them do so well and see a sandwich I ate so often as an adolescent gain so much popularity. Though they were the top earners for each competition, they came in second place. Shocking right? That does not mater. 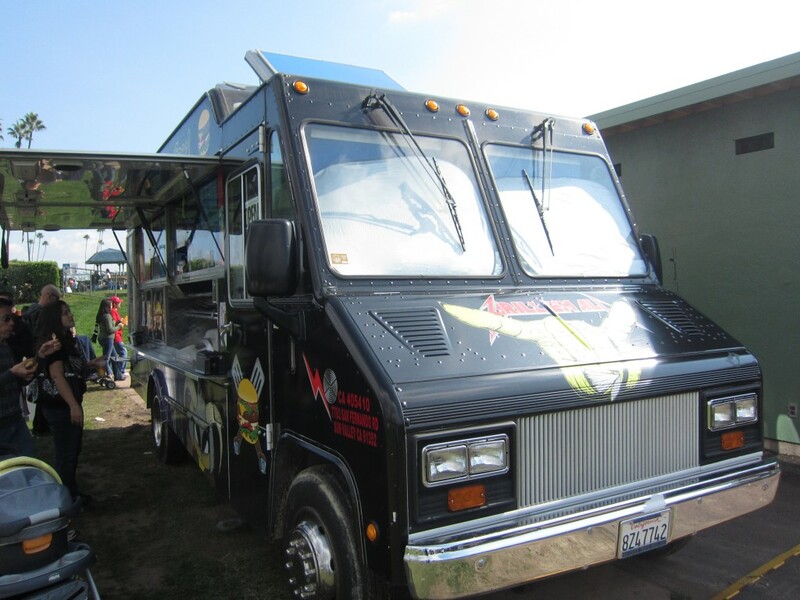 The show gave them enough publicity for them to become one of the most popular food trucks among Los Angeles residents. I was fortunate enough to try the grilled pork banh mi. First off, this thing was huge. Huge chunks of meat were inside, which I loved. I think they grilled the pork inside the truck because I saw smoke venting out of the top of the truck. The pickled veggies went so well with the pork. I think banh mi sandwiches are so good because of these veggies. I love the freshness of the cucumber and strong taste of the cilantro. I got a little bit of heat from the jalapeno slices — a lot of heat for some. All in all, I enjoyed the sandwich very much. My favorite banh mi sandwich is the deli special. Thit Nguoi, a Vietnamese salami containing cured pork and fat and Cah Lua, a cooked pork roll along with some fatty pate are included in that ingredient list. Most people would probably not order this because of the unfamiliar ingredients, but for the adventurous eater, this is a treat. 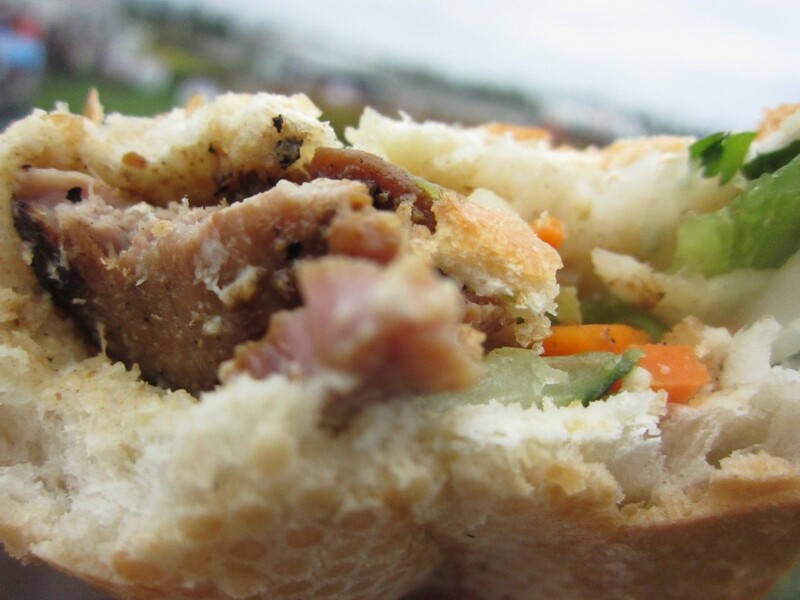 Other popular sandwiches include lemongrass chicken, vegetarian tofu, and of course, the grilled pork. I would love to try them all. Some people might not like to stray away from their ham and cheese on white bread. The flavors of the banh mi are somewhat exotic and different. Believe me, the banh mi sandwich is something to consider. 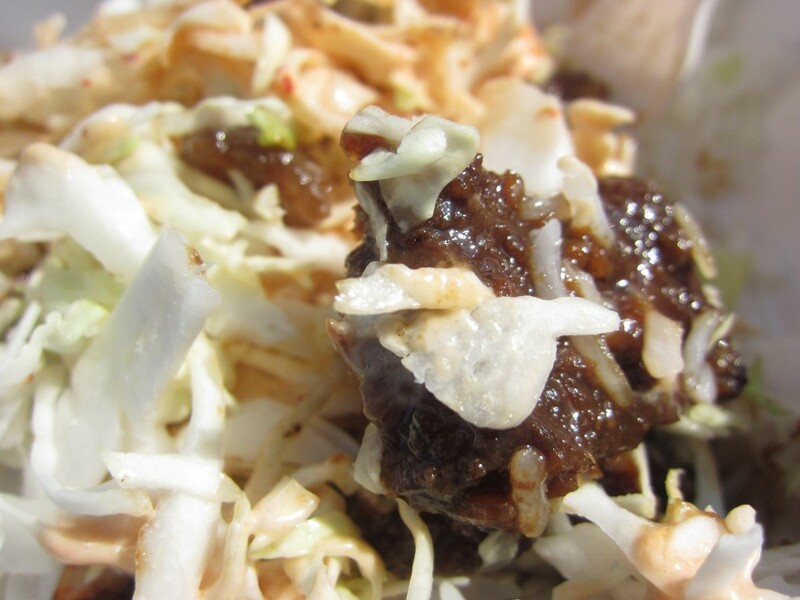 Try something new and give it a try — a good way for Angelinos is to find the Nom Nom Truck (@nomnomtruck). They make a really good banh mi sandwich and — you will thank me later. Get yours now, before they sell out! Who knows, you may fall in love. As a Korean American, I love Korean food. I ate it growing up, and it gives me a sense of home when I eat it. 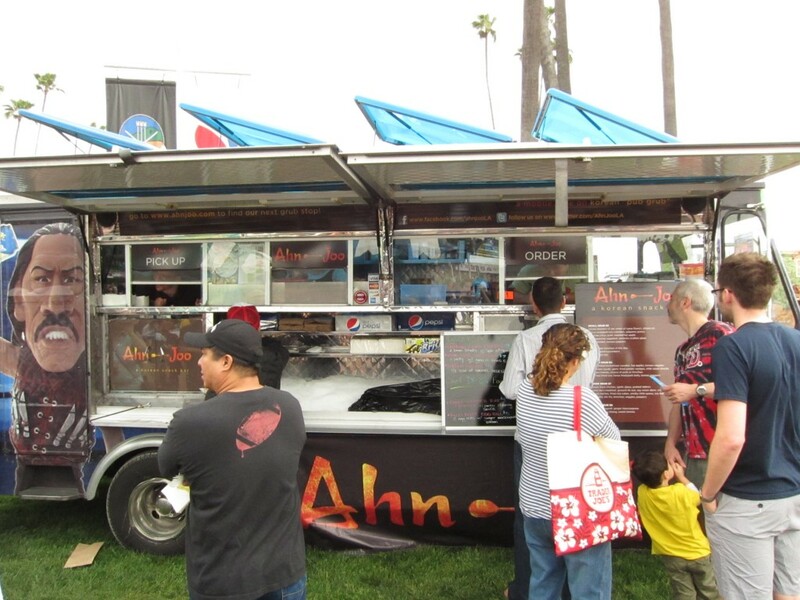 I was excited that the AhnJoo Truck was going to be at the Santa Anita Food Festival, and it was my first stop. AhnJoo is something of a snack or appetizer you have as you drink — alcohol. The name is perfect for the truck because they serve some great bar food. I had their Korean fried chicken with garlic glaze, and their Korean Nachos. The fried chicken was very tasty. 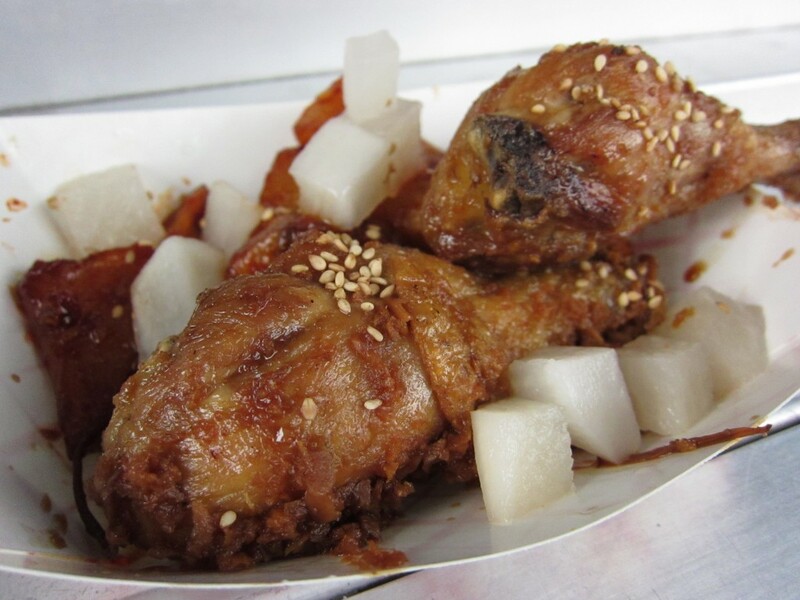 The drum sticks were covered in this garlic sesame glaze that was deliciously sweet. The pickled daikon radishes made it stand out even more. Eating the chicken with the pickled radish was a great combination. This is a classic Korean dish and this one hit me in my soul. The Korean Nachos was my least favorite, but good nonetheless. 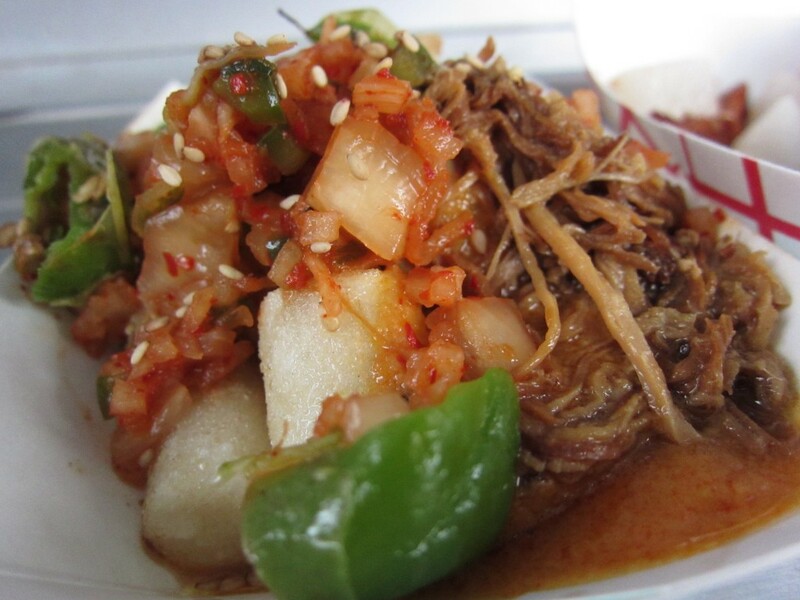 It was a base of fried rice cakes topped off with cheese, marinated pork, and kimchi salsa. I still have a huge problem with eating Korean food with cheese. The Korean diet does not consist of anything dairy because there was no dairy back in old-school Korea. These days, the trend for Korean fusion restaurants is to put cheese on traditional Korean cuisine. I find it odd. I guess I am a traditionalist after all. I was glad that I tried the AhnJoo Truck. Debbie Lee from the Food Network started the truck, and her culinary background shows in her menu. I may come off as sounding a bit biased, but I like to think that Korean Fusion recipes started this whole food truck craze in Los Angeles, namely Kogi BBQ. 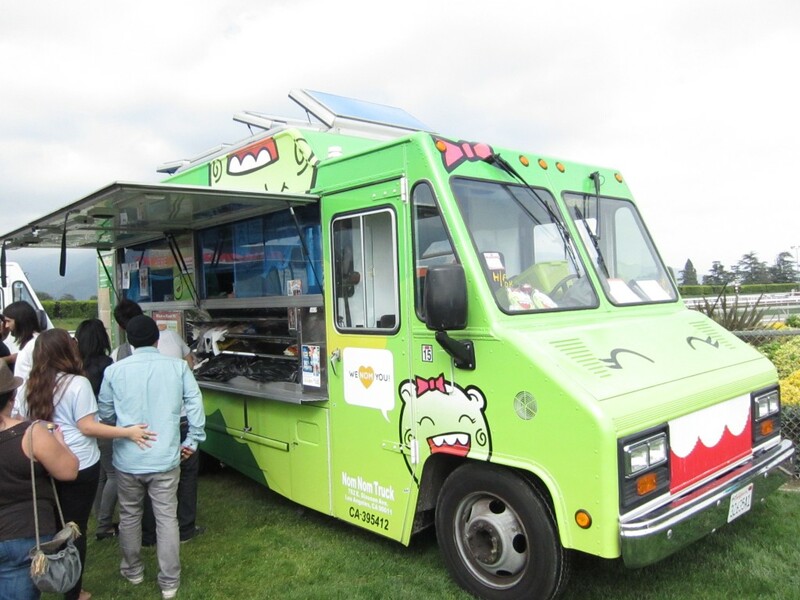 Food trucks aren’t going anywhere (though they are), so it is always a treat to try new ones. AhnJoo has provided some home felt eats from a truck. Thank you guys! San Gabiel Valley Food Truck Fest – No Joke!